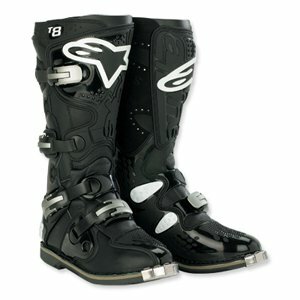 Motocross riders who have been around the track know exactly what these are: these are Alpinestars' Tech 8 boots. Well known and well worn, many riders stick with these when it comes time to get a new pair of boots. There are numerous reasons why these have developed such a loyal following in the community, and I'll touch on a few. Starting with the external construction, the Tech 8 has a full grain leather upper. A rubber gaiter at the top keeps out mud and rain, and contoured shin and calf protectors are injected with high modulus PU for superior impact and abrasion resistance. The inner side panels are stamped suede laminated with aluminum. This design aids the rider in grip and prevents heat damage. Riders will be thrilled to find that the self-aligning quick lock and release buckles are also aluminum. These won't break easily like some other brands that shall go unnamed. Replaceable shock absorbers mount on the shin and instep. Stamped steel protects the heel and sole, and there are more PU-injected plates and panels than you can shake a stick at. All of these protective features are balanced with comfort features. Many of the panels are perforated to allow for ventilation, which is aided by the breathable lining. Flex panels permit unrestricted movement where you need it, and I'm sure the box comes with a coupon for a free unicorn. This boot has just about everything you could ever want in a riding boot and a price tag that will bring you crashing back to earth. Reality is inescapable. Most products have a few key points that can be covered quickly, but I encourage you to do some research on the Tech 8 because the feature list goes on and on. Don't let the injection molded armor stop at your feet, though.